Avid pilot and sailor Stuart Woods has penned more than 35 books, often incorporating his own flying experience. 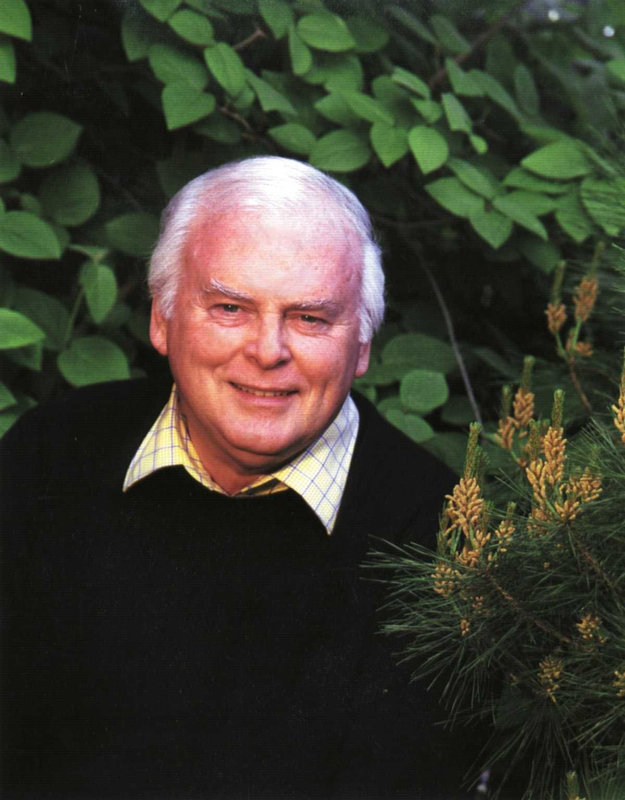 Bestselling author Stuart Woods has lived a life of adventure that reads better than some people’s fictional exploits. At least he doesn’t get hit over the head as often as the characters in his 35 bestselling, action-packed crime novels. As an avid pilot, Woods traverses the country and the world as nimbly as his most popular fictional hero, Stone Barrington. 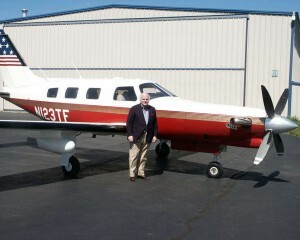 In fact, you can find the tail number of the author’s Piper Malibu Mirage JetProp—N123TF—in several of his books. In 2001’s “Orchid Blues,” starring popular series character Holly Barker, Woods inadvertently used N123TF on two different airplanes. His readers noticed, and he still gets comments about the minor gaffe. It’s a small worry for an author who has risen from his humble roots in rustic Georgia to become one of the most prolific crime novelists in America. It’s taken a lot of time and effort to get to this point. Woods now publishes two novels each year. Woods graduated from the University of Georgia with a bachelor’s degree in sociology and moved to Atlanta, where he enlisted in the Air National Guard, while working in a men’s clothing store to make ends meet. In the fall of 1960, he moved to New York to start a writing career but was sidetracked into a decade of advertising work. He spent the greater part of the turbulent decade working for Madison Avenue agencies, except for the 10 months he spent in Mannheim, Germany, with the National Guard. He was based there from 1961 to 1962, during the diplomatic crisis that involved the Berlin Wall’s construction. The Big Apple wasn’t peaceful enough for Woods to jumpstart his literary career, so on an impulse, he moved to London. There, he worked in advertising agencies for three years, as his debut novel started to come together. He moved on to Dublin, Ireland, where he worked two days a week for an ad agency, writing fiction in his small flat near a castle in South County Galway. Stuart Woods flies to book signings in his Piper Malibu Mirage JetProp, modified with a Pratt & Whitney PT6A-35 turbine engine. He spent 18 months learning about sailing and celestial navigation, while his boat was being constructed in Cork, Ireland. Woods went far beyond sailing as a hobby. In 1976, he competed in the Observer Single-handed Transatlantic Race, a yacht race that started in Plymouth, England, and ended in Newport, R.I. He completed the race in 45 days, finishing in the middle of the fleet, in the smallest boat. That may be an understatement. Woods competed in the disastrous 1979 Fastnet Challenge Cup, a yachting race in England. Storms that year caused the deaths of 17 competitors, leading to the overhaul of the rules and equipment requirements, although Woods and his team finished in good shape. Later that same year, he sailed a friend’s yacht across the Atlantic, stopping at ports in the Azores, Madeira and the Canary Islands, before finishing at Antigua in the Caribbean. Returning from Ireland in 1976, Woods went home to Georgia, where a left turn into national politics also led him to his ongoing interest in aviation. During the free time between his campaign responsibilities, Woods took to the air. Unfortunately, he had a slight delay in pursuing his pilot’s license. While dabbling in flying lessons, Woods wrote two non-fiction books: “Blue Water, Green Skipper,” a memoir of his experience living in Ireland and participating in the OSTAR competition, and a travel guide called “A Romantic Guide to the Country Inns of Britain and Ireland.” Both books are out of print. “You’d have to go to a lot of garage sales to lay your hands on one,” Wood jokes. Readers can look forward to buying “Fresh Disasters” in April, which pits Stone Barrington against the New York mafia. Woods got a $7,500 advance for the novel he started in his little flat in Dublin, based on the dramatic first 200 pages he showed the publisher. With contract in hand, he rolled up his sleeves, got to work and finished the book not long afterwards. In 1981, W.W. Norton in New York published “Chiefs,” a book Woods had been imagining since childhood and one of his finest works of fiction. The epic novel, which was re-released in a special 25th anniversary edition last year, is an ambitious, multigenerational story of murder and corruption in the south. It spans 50 years, beginning in 1919 with the first police chief’s appointment in fictional Delano, and leads up to the life of Will Henry Lee, a failed cotton farmer who becomes the newly installed police chief. The hugely successful book won the Edgar Allen Poe Award from the Mystery Writers of America and was hailed by critics. While it only sold 20,000 copies in hardback, the paperback version sold with gusto. “Chiefs” was also made into a popular television miniseries starring Wayne Rogers as Will Henry Lee. The cast also included Charlton Heston, Danny Glover, Billy Dee Williams and John Goodman. 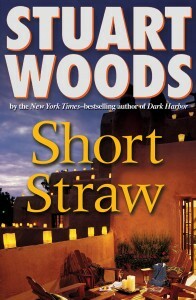 Lee appears in a half-dozen other Woods novels, including more recent entries, “The Run” and “Capital Crimes,” which bring the character to Washington, D.C., as an earnest senator from Georgia. Lee remains a favored character among both readers and his creator. Woods married in 1984 but the marriage ended in 1990. The union inadvertently led him back to flying. 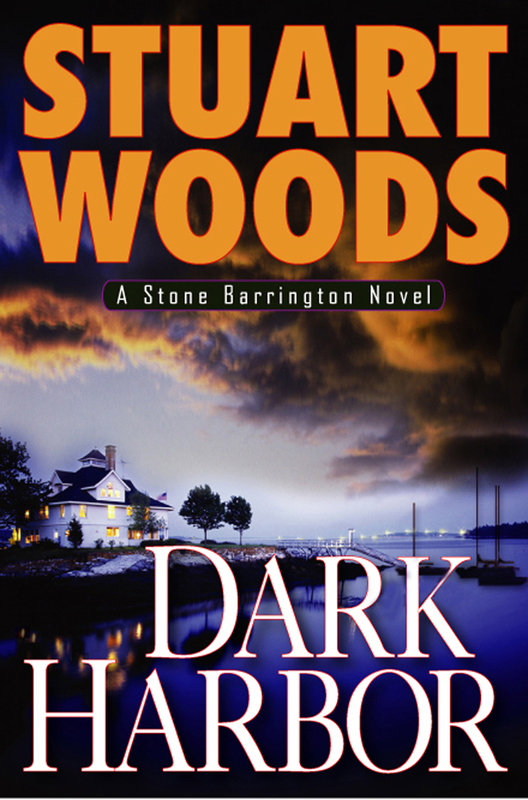 Stuart Woods’ most recent Stone Barrington novel is the 2006 thriller “Dark Harbor,” which finds his series hero investigating murders in Maine. With seven novels under his belt, Woods decided to introduce a new character in 1991’s “New York Dead.” It proved a wise decision, as the book’s protagonist, a hard-hitting police officer named Stone Barrington—who later evolved into a globetrotting attorney—became his most popular character. “Stone Barrington is certainly my readers’ favorite character,” Woods acknowledged. Woods is complimentary yet candid about Barrington’s flaws. 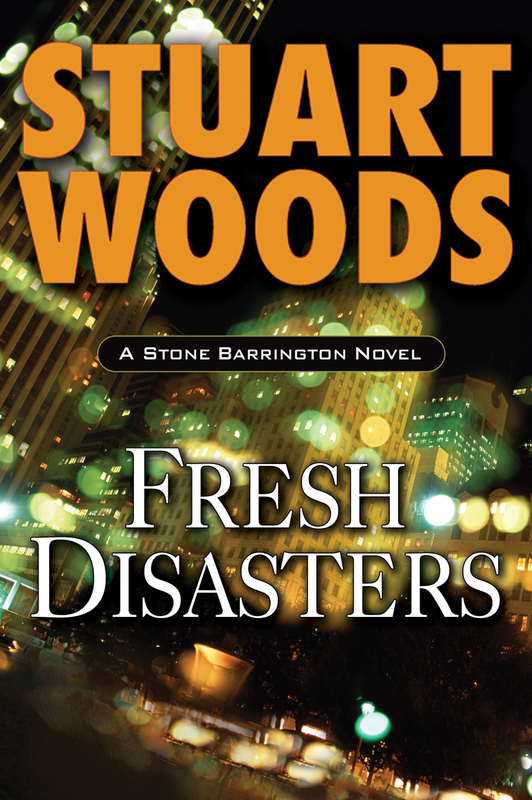 Stone Barrington returns in April in “Fresh Disasters,” a new adventure that finds the crime fighter cozying up to a powerful New York mob boss. Readers can look forward to another adventure, “Shoot Him If He Runs,” in October 2007. The book will feature Stone Barrington as well as the return of Will Lee from “Chiefs” and small-town sheriff Holly Barker, who’s recently moved up to the Central Intelligence Agency. Although he’s a well-known brand name in the mysteries and thrillers genre, Woods doesn’t read any of his contemporaries, choosing instead to fortify himself with Winston Churchill’s six-volume history of World War II. With the success of his many novels, the author has been able to indulge his fondness for flying. 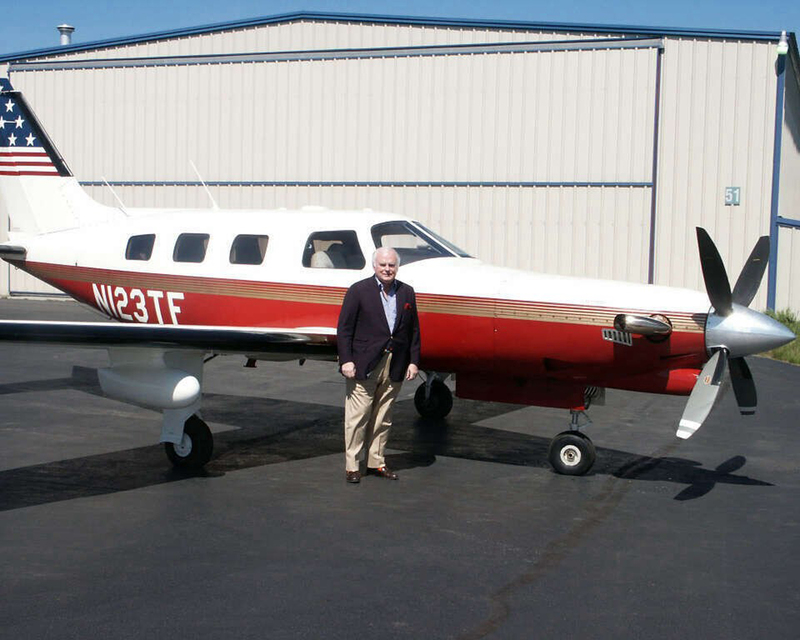 Woods has owned four airplanes, including the law firm’s Cessna, a Beechcraft Bonanza B36-TC and his initial Piper Malibu Mirage. He currently flies his second Mirage, a six-passenger, pressurized aircraft that has been converted to a jet prop. The Mirage is so comfortable that Woods fondly refers to it as a “miniature Air Force One.” It’s also a utilitarian tool for the busy writer; he uses the Mirage to get to book signings and other appearances. In fact, readers probably wouldn’t get to meet their favorite characters’ creator if it weren’t for his airplane. In addition to his aircraft, Woods also maintains his enthusiasm for watercraft. He keeps a 28-foot power boat at his winter home in Vero Beach, Fla., and is a partner in a 1935 85-foot motor yacht called Enticer. He’s also looking at upgrading into a new aircraft. Though he’s under no financial pressure to land a new airplane, he’s eager to get into one of the new jets. “I’m just hoping I’ll be able to get myself into one before I’m too old to fly them,” he exclaimed. For more information about Stuart Woods and his novels, visit [http://www.stuartwoods.com].